Cool mod! Any chance of an update? 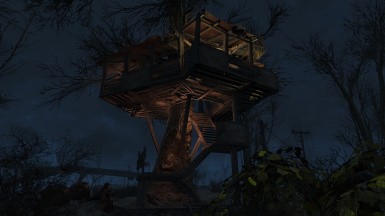 the treehouse looks awsome! how does it work? is it a single plot? I am absolutely in love with your creations. 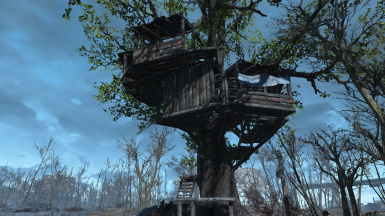 The tree houses are amazing. I turned Sanctuary into a pagan-esque settlement with nothing but tree houses, the stone circle, the Midsummer Pole and other related decor. It's sweet! You wouldn't happen to have screenshots of that would you? 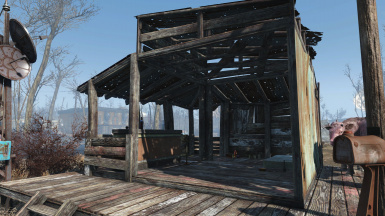 Would be cool seeing a pagan-esque themed settlement. I wish I had taken pics, but then something happened to my save and I had to start over, and now I'm playing Horizon. But I will eventually go back to vanilla and SS to remake my pagan village, and be sure to take shots of it! Sounds like it looked pretty awesome. I'll be playing Horizon myself so I imagine it will take awhile to build up this time around haha. Before downloading this mod, I would ask something first: is it possible to determine which residential building style would exceed the 2x2 plot size or not? That allows me to plan my plots more accurately (maybe leaving those as stand-alones or at the end of a plot sequence. 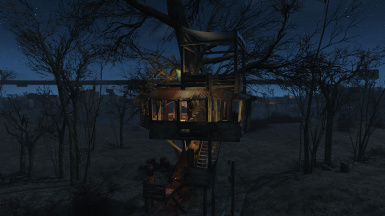 Awesome tree houses Jibb! cant wait till you do some with two bridges or even four! I could make a total raised housing complex with bridges going throughout all my housing. Keep up the great work. 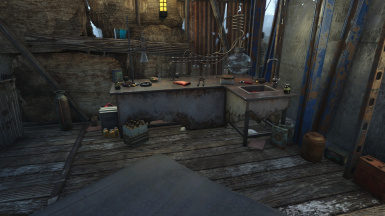 Long time Fallout 4 gamer, but haven't played through since June of 2017 so I figured I would load up the game and try out Sim Settlements to what all the buzz is about. 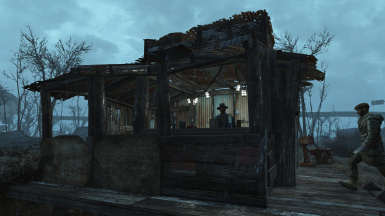 I am set up in "Automatic" mode with a leader for each settlement and nothing to do except "wander the commonwealth". That said, I really like your designs. 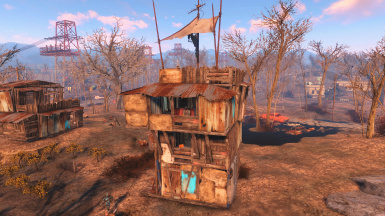 The question I have is will the Sim Settlement automation mode I am in eventually "pick" your work in its random sort of way and use your homes or do I have to manually place? 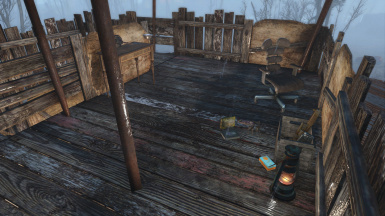 If you use designer's choice you won't see anything not included in the base mod because that's the list the original set of blueprints used. If you toggle that off, then plots are semi-randomly chosen from the full list.Semi-random in that it tries to place plots that haven't been placed yet/are new. You can also always change the plot selected if you so choose. 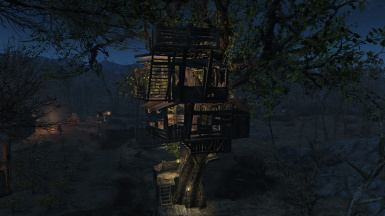 Just wondering...are the housing plots "Golden" and "Gate" Treehouses supposed to be placed to connect to each other? Maybe I am misreading descriptions. 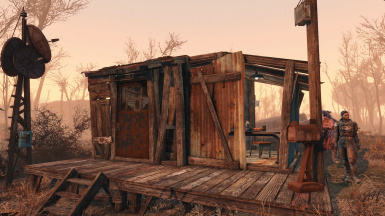 Awesome mod, been using it for a while now...with every other sim settlement pack I believe. Nice Job! The secret is to place them with the distance of one housing plot between them at the same height as well. If they are on the right side then you'll see why they are named as they are. Thanks for the new update, Jib! Can you add changelog to your mod? I am currently in place with slow internet and don't know if v 1.0.2 introduces so important change to make me download it. The changes for 1.0.2 are 3 new houses and I fixed a few issues that were in there. It isn't a huge change but I wanted to do a bit more. Sadly I don't think I will be able to work much on this anymore as life is taking its hold on me. Thank you for this mod, I've really enjoyed your artistry, and I am insanely jealous of your talents (both artistically and technologically). 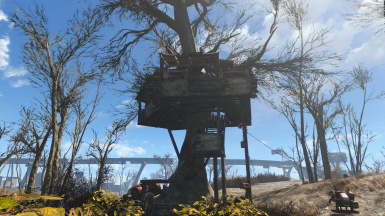 The tree houses in my settlements not only look amazing, but have that real Fallout feel. 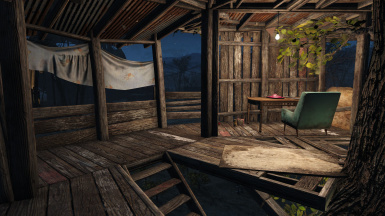 Can we have a confirmation that this mod is still receiving updates and bug fixes from the author please? Yes, I took a few weeks off to deal with some personal things but I am back working on this mod. 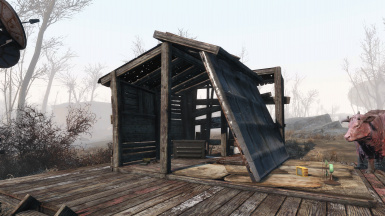 I have some ideas for new houses. I just need the time to do them, hopefully soon I will have something for you. P.S. I still won't be able to contain myself inside the 2x2 plot size.